Click on View circle to change the values used to size the circles on the map. Click on a Facility Group legend circle to exclude or include a whole group from the map and summary totals. The aggregate totals at the bottom of the map are adjusted as you filter the data, as is the Summary side panel data table and pie chart. Click on any circle (Facility) to expand the Details pane for the facility. When the visualization first loads, the default view is to show each facility with a circle color-coded according to its Facility Group, and with a diameter proportional to its relative size in square feet. In the top left corner is a small legend that shows the scaled size of the average and maximum circles. This legend will change according to the View you select from the right panel, and according to any Filters you might apply so that it only reflects the values of the visible facilities. 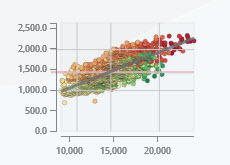 The left edge of the visualization has two additional panels. The lower of the two is summarized view of all the facilities in scope, along with a table of selected details for each property. The table of data can be sorted in order to show a rank for each facility according to the selected attribute. Note that when the visualization first loads, there are 474 facilities in scope, with a combined square footage of over 15 million square feet. In the right panel, click on the purple circle for Boston Schools and see that the purple circles are all removed from scope, and that the aggregate values drop to 341 facilities with just over 4 million square feet. And with one click, we can see that all non-school facilities in Boston had an average EUI of 140.2 kBtu/ft2 in 2015. 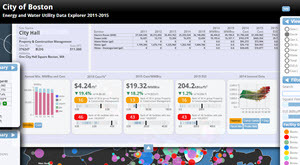 The visualization offers several different Views of the available data. The View you select determines the values that are used to determine the size of the facility circles. As you switch views, the circle sizes will change according to each facility's relative measure for the chosen view. Choose a View from the top section. The default view is Size (in ft2). Choosing a particular view could result in disappearing facilities that have zero data for a given view. For example, there are only 4 facilities that have Steam usage in 2015. All other facilities will disappear when that view is chosen. Notice that as you change the View, the circles on the map will change size according to the values for each facility. Switching among the different views is a quick way to get an overview of the relative amount of each commodity or measure for all the facilities in scope. Switch the View selection to Oil and see that most facilities disappear on the map; only those facilities that consumed Heating Oil in 2015 remain. A quick scan of the remaining facilities shows that two BPD facilities and one BFD facility were the largest consumers of heating oil. Mouse over the different facilities to see a few details for each. Use the Square Feet slider control to filter the data to include only those facilities in a certain size range. Note that many facilities in the dataset show a zero square footage and will disappear from the view if the slider range does not include zero. Use the EUI slider control to reduce the dataset to only those facilities in a certain EUI range. In this case, facilities with a zero square footage are always included in the view, but the EUI calculation is meaningless for these facilities. In general, only facilities with a Facility Type of BLDG have a meaningful EUI calculation. The aggregate totals at the bottom of the display will update according to the filter conditions you have set here. 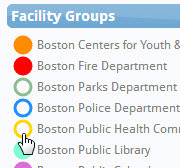 Click on a circle in the Facility Groups or Facility Types lists to show or hide facilities according to their Site Group or Type classification. For example, to show only the Boston Public Schools, click on the circles for all the other Facility Groups to turn them off. To filter for just Buildings, turn off all the Facility Types except BLDG. Click on any facility on the map to reveal a slide-down panel with details for the selected facility. Click the up-arrow at the bottom of the panel to close it. The details pane shows a wealth of facility information just short of individual billing records from the main dataset. In addition to the intrinsic details of the facility, we show certain values in the context of other facilities in the Boston portfolio, in the form of a "rank" that helps to compare a given facility to its peer groups. Finally, for the 54 buildings where 5-minute electricity data is available, we show that data in various forms. In the top left corner of the detail pane, you'll find the basic facility data such as square footage, address, etc. In the table to the right of the basic data, you'll see the 5 years of summarized usage by commodity, followed by 2014 and 2015 conversions to MMBtu (energy), two recent years of total cost for each commodity, and finally a calculation of the EUI contribution for each commodity (using the 2015 MMBtu). The point of showing this table is to reveal the entire set of numbers that are used everywhere else in the visualization - these are the data values that are used for calculating circle sizes on the map, EUI values and costs, as well as rankings of one facility versus the others. In this version of the Energy Map, we don't show the individual detail records that make up the commodity usage or cost summaries that are shown in the table. That's a logical thing we will add in a coming release since it can obviously assist in billing reconciliation. The underlying data typically shows all the elements of an electric or gas bill, such as billing period, rates, account numbers, etc. In the bottom portion of the details pane are five different presentations of the detail data. 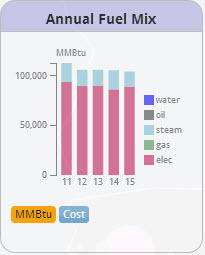 In the leftmost sub-panel, we show the 5-year data for the facility in terms of MMBtu and Cost in a stacked bar chart. Use the selector below the bar chart to switch between the two. You'll note that water has no MMBtu contribution, and we fairly assume that any energy used in the acquisition and transport of water in the facility is covered by the energy usage of the other commodities. For cases where the 5-year trend seems erratic, read our discussion below on "Data Quality" for some reasons why this might be the case. In the second sub-panel, we show the calculation of the facility's total commodity cost divided by it's size to arrive at a cost per square foot. This value does have some relationship to the EUI but since all Btus do not have the same cost, this value can be compared with other facilities to see the influence of commodity mix. Further, some agencies such as EIA in its Commercial Buildings Energy Consumption Survey will show cost per square foot as one way of ranking facilities of a given building type. We show the net change between 2014 and 2015 in terms of a percent increase or decrease. The color-coded rankings come in two varieties. In the top ranking, we show how this facility compares to the other buildings in the same Facility Group. This isn't always a fair comparison of a given facility - the Boston Schools Central Kitchen is a good example of a "school" property that really doesn't look like a school - but it is fair to compare each facility to its peer group to at least see the range of values across the group. In the second of the two rankings in the sub-panel, we compare the facility to other facilities of similar size. Again, this isn't always a fair take on whether a facility is more or less cost effective with its use of energy, but it is fair to show the relative rank in order to quantify the range of values as a reference point for a discussion. In both rankings, we show a bullet chart that shows a black tick mark for the selected facility along with light blue tick marks for all the other facilities in the peer set. In general, the facilities within a set will show a clustered set of blue ticks along with a few outliers on the scale. The black tick mark is telling you how far from the "majority" the given facility lies. So, in the example above (East Boston HS), we can see that in 2015 the spend for all commodities was $1.64/ft2, and that was an 8.4% decrease from 2014. The school ranks #95 of the 133 facilities in the Boston Public Schools and is #31 of 48 in all buildings over 100,000ft2 in size. 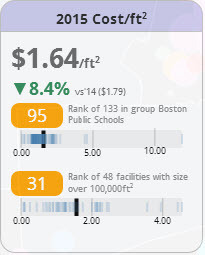 The cluster of other schools around $1.50 in the top bullet chart suggests that East Boston HS isn't too far off the norm in terms of the cost per square foot of their utility spend. The third and fourth sub-panels are very similar to the second sub-panel but show, respectively, the cost per MMBtu at the facility and the EUI calculation for 2015. As with the second panel, the ranks are color coded green/orange/red to quickly identify how a facility ranks in terms of peer Group and peer Size, so it might be worth noting here that it's entirely possible that a facility may rank very well by one measure and then not so well by another. How can this be? Consider again the case of East Boston HS shown above. The school has a very good ranking in terms of what it pays per MMBtu of energy (green in terms of cost per MMBtu), but is much lower on a scale of MMBtu per square foot basis (red when compared to other schools and other facilities over 100,000ft2). So it pays less than average for the energy it uses, but it uses more of it on a per square foot basis. The fact that the Cost/ft2 shows a middle rank (orange) is actually the combined effect of what it pays per unit of commodity and how it uses that purchased energy. The fifth and final sub-panel shows 5 minute interval electricity data for the 54 buildings where that data is available. As of this writing, only 2014 data is available from the City, and only for that subset of 54 buildings where the Utilities were gracious enough to provide the interval data. At this time, the City has only been able to provide 2014 data from the Energy Portal Online. For customers that engage with AEI, these and other visualizations are updated weekly or monthly as the data are made available. 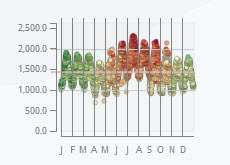 Also, the thumbnail as shown is only a tease of the full-featured version of this interactive chart which shows load percentiles, regression calculations versus weather and ISO load, filtering by occupancy, season, time-of-day, and many other features that make this interactive chart a vital tool for understanding a facility's load profile. Load is plotted against Outside Air Temperature (OAT) for the 02201 (Boston) zip code. The points are color-coded by OAT from cooler temperatures (green) to warmer (red). There are 8,760 points on the chart, each point is an average load value for each of the 8,760 hours in 2014. 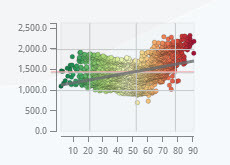 The three horizontal lines on the chart show the 5th percentile, 50th percentile (median) and 95th percentile loads. That is, for 5% of the hours in the year the load at City Hall was at or below 1,000kW. Even with this small thumbnail view we can tell that most of those hours were in the 40°F to 60°F range of outside temperature. What is not shown is that we know those hours are also predominantly in the shoulder season and during nights and weekends. We can fairly estimate the base load for City Hall at this value of 1,000kW. Conversely, we can see that the 95th percentile is just under 2,000kW and that load is predominantly seen when temperatures are above 70°F. The upper right cluser of points - where both load and outside temperatures are above the 95th percentile - is the holy grail in terms of reducing a facility's peak demand since we fairly know that the ISO annual peak will occur in the summer on a very hot day, and we see that City Hall also has higher demands at those same high temperatures. The actual R2 for the apparent correlations are not shown here in the thumbnail view, and of course it makes sense to filter the data by season to make those calculations, and we do that in the full-featured version of this widget. When we filter for just the Summer months, the correlation between Load and OAT has an R2 of 0.71. Here the facility load is plotted against the ISO New England hourly average load. The points are still color-coded by OAT from cooler temperatures (green) to warmer (red). While it's clear that City Hall's load tracks with the ISO New England system load, the correlation is only 0.55 over all hours in the year. When we filter the data for just peak hours in Summer, the correlation improves to 0.74 which tells us that both ISO New England and City Hall probably have a common effect - namely weather - that best explains their demands. No surprise here. What's more interesting is that there are hours where City Hall's demand is signficantly lower than the overall ISO demand, and vice versa. This suggests a lead/lag effect, or that City Hall might engage in some demand response that follows ISO predictions when they fall below the trend line or, conversely, that occupancy patterns cause higher demands when the grid suggests that the facility demand should be lower. In other words, there are hours when City Hall has a demand above it's 95th percentile even while the grid is at its median. Speculate at will, the point of the data presentation is only to understand the data relationships in an effort to get at the root cause of energy usage. The Facet WK (by week) shows a 7-day average profile, with each day of the week displayed as a wrapped 24-hour profile. Each point on the chart represents the hourly average value for each hour-of-day and day-of-week for all hours in the year. The points remain color-coded for outside air temperature. This view of the data is useful to examine how a facility sets back on night and weekends. In the example at right, for City Hall, we see a sligh tendency to set back on weekends but we also see some hours approaching the 95th percentile on Saturdays. For a facility that is fairly open to the public during most daylight hours, this is not unexpected. We also note that higher loads come with higher temperatures - consistent with the previous views of the data. At the border between each day - the midnight hours - we see a tendency for the facility to set back to about 1,000kW. The Facet MO (by month) is similar to the Weekly version shown previously. Here we instead show a composite 24-hour profile for each month of 2014. This view of the data isn't as much about set back as it is about the general 24-hour profile for each month of the year. In the example at right (City Hall), we can see that July 2014 had a nightime "set back" load that is nearly the median value for the entire year. Clearly, the facility has a high thermal mass and requires cooling even in the overnight hours to maintain space temperatures during the day. Given the exceptionally warm temperatures in that month, any outside air introduced into the building likely needed conditioning. 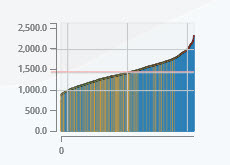 The "cumulative curve" shows loads in ascending order from low to high. This tells the basic distribution of loads over the year and the approximate amount of time spent "at or below a certain load". The horizontal lines are, as with the previous views, at 5th percentile, 50th percentile (median) and the 95th percentile of the load data, thus showing the general tendency of loads at the facility. In the full version of this graphic, we make certain calculations to illustrate how the peak demands above the 95th percentile can be effectively identified and controlled to help reduce demand charges. In this default view of the cumulative hours, weekend hours are shown in orange and weekday hours are shown in blue. We expect to see the orange values skewed heavily to the left which tells us that weekends have a tendency to draw lighter loads than weekdays. We also note the overall shape of the curve. The fact that there is a smooth distribution of loads across the year suggests a large facility with many different load sources, none of which dominate the meter. Some smaller facilities with a large RTU might show a "bump" in the curve when that load comes online, and by noting the inflection point we can estimate it's duty cycle. Finally, a flatter curve suggests one of two things: Either the facility doesn't have wide "mood" swings where demands are spiking well above average, or perhaps the building is "always on" - the average load is always high, and so there are fewer energy assets left to turn on. Click on the bottom left flyout panel to see a table of representative data for the facilities that are in scope. The table will rank the facilities by a few key parameters, and you can change the parameter for ranking by clicking on one of the column titles. By definition and on purpose, only facilities with Asset Type BLDG are shown in the summary. The pie chart to the right of the table will show you the proportions of each aggregate value by Facility Group. You can use the button selectors below the pie chart to change the measurement property that should be aggregated. In the example above, we removed Boston Public Schools from the scope and then clicked on the 2015 Cost column to rank the non-school buildings by cost. We see that City Hall ranks #1 in terms of cost, and that the entire Facility Group of "Property and Construction Management" is approximately 25% of all utility costs when schools are excluded. With the Filtered Data Table open, click on the 2015 Cost column to see that Hennigan ranks #5 of all buildings in terms of 2015 utility costs. Click on the Hennigan row to give it focus. Now click on the Size (ft2) column, scroll down the list to see that Hennigan is #33 in terms of size. That goes a long way to explaining why it has an EUI of over 600. Now close the Filtered Data Table to fully reveal the details for Hennigan. Despite it's smaller size and higher EUI, it ranks #2 in terms of cost per MMBtu. The increase in natural gas consumption and decrease in electricity consumption between 2011/2012 indicates combined heat and power (CHP) equipment may have been installed in 2012. 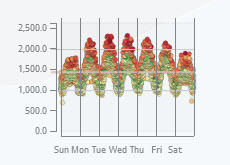 The 2014 interval data Facet WK view indicates co-generation equipment that (1) may be on a weekday schedule, (2) may not operate on weekends and (3) may be off on holidays. Is the assumed CHP equipment operating efficiently? Is there a data issue? Some answers... More questions! The "Today" column comes from the ISO NE Morning Report which is published at least once each morning, usually before 9am ET. This column shows the total committed capacity available to the region based on the basic Capacity Supply Obligations to the grid, and adjusted for capacity additions and outages. The other columns in the table are from the Seven Day Forecast and represent ISO New England's best estimates of capacity and demand for the coming seven days. We show their estimation of whether any upcoming day will trigger a power Watch or Warning, and we use this in combination with our statistical tracking to alert our customers to upcoming events. Every 5 minutes, we take a real-time demand reading and present it below the table in terms of projections and trends. This is a grand over-simplification of what we do, but the net effect is that when color codings start to turn orange and then red, that means the region is showing some combination of local or seasonal peak loads. In the example shown above, we can see that at 3:15pm on July 06, the current load at that time was at 98.1% of ISO's prediction for the day, with Boston temperatures in the 90s. In the Morning Report ISO forecast that the peak for the day would be 23,000 Megawatts (MW) and would happen in the 5pm hour. We can also see that the system load at the time was 100% of the FY17 peak so far this fiscal year - which is not suprising as we move into the hot months and are setting new peaks early and often in July. The frequency of new peaks will start to taper off later in the summer, but we cannot rule out a surprise in September. The trick is to figure out which peak in the next few months will be used as the annual peak that sets your ICAP tag and your capacity charge for next year. So while the goal posts keep moving, we will always recommend a certain amount of dedication to demand response protocols anytime we see certain combinations of indicators, combined with weather and historical data, that predict a likelihood of coming within 95% of an annual peak. For it may turn out that this summer turns exceptionally cool, and it's possible that an annual peak has already been reached or is nearly upon us. Translation: If you are responsible for a school that is largely shut down over the summer, you can use the facility's Interval Data to determine if it is truly counter-cyclical to the ISO load pattern. Then, by staying in touch with the real-time ISO reporting you can insure that your facility energy is reduced to the minimum possible level on those days where ISO and recent data trends are hinting at a peak. Great question! Given the volume of data buried in the billing records of a typical municipality, campus or in a portfolio manager's accounting software, the value of this data isn't always straightforward. It really comes down to the set of questions that a given constituency might ask and then whether or not the data can answer those questions. Our design goal wasn't intended to answer any specific questions, but instead to disaggregate and reassemble the data in certain ways that allows the creative user to interactively arrive at the answers to a wider range of unknown questions. In other words, to explore the data. Is the BFD more energy efficient than the BPD? What is the range of EUI at the Boston Schools, and I should I be concerned if one school is twice as energy intense as another? Given the relatively lower cost of natural gas and, conversely, the upcoming increase in electricity demand charges over the next two years, should I be looking to alter the energy mix at certain facilities? Which set of buildings have the best energy efficiency opportunities? We combined several publicly available datasets and then disaggregated them into a normalized relational dataset. The normalized data was then imported into the AEI analytics platform and combined with our standard visualization toolset and GeoJSON shapefiles provided by the City of Boston to produce the final product. 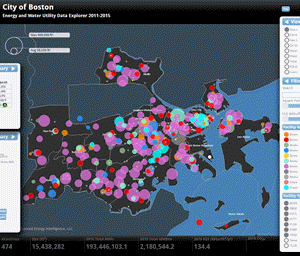 City of Boston "Energy and Water Use 2011-2015" obtained from https://data.cityofboston.gov/. This static dataset has over 700,000 of detailing billing records for approximately 2,500 facilities in the billing domain of Boston. This is the main dataset that drives the visualization in terms of energy use per facility. We eliminated the data related to Street Lighting and Traffic Control Boxes because they are distractions in terms of EUI calculations and other building metrics, so the resulting subset of data contains 341,276 billing records. For 54 of the properties found in the main dataset, we incorporate the 5-minute interval data from the electric meters at those facilities. This data was collected from the relevant electric utilities via the Energy Portal Online available to any facility with time-of-use metering. To access this data for your facility, contact us for details or consult your rep from National Grid or Eversource. We incorporate a real-time feed of the ISO New England morning report, the seven-day summary, as well as 5 minute updates on the current regional load. These data are made available by ISO New England by way of publicly available web services. Visit http://www.iso-ne.com/ for more information. Municipal Pools show extremely high and irrelevant EUI. This is because the square footage at the facility is clearly understated. When considering a municipal pool, it's very likely that the square footage was assigned to the small control room and doesn't adequately reflect the size of a large municipal pool. Street Lighting and Traffic Control boxes are electricity consumers but also show a zero square footage in the data. Given the specialized nature of these facilities, the initial view of the visualization hides SLCB and TLCB asset types. This is why we eliminated SLCB and TLCB data in our work. We cannot know if there is missing data for any given facility. We do know that certain facilities have recently installed Combined Heat and Power (CHP) equipment, and this can lead to erratic year-over-year totals for electricity and gas which, of course, affects the EUI calculation. In other cases, it may be that certain utility providers are not included in the billing data, or are included in some non-standard way. In many cases, the EPO 5-minute interval data for 2014 was flat-lined for months at a time. We have done our best to filter out the zeroes and only show calculations on the non-zero data, simply because it doesn't make sense to calculate the average load of a facility with zeroes included. In general, as with any datasets built from a wide range of upstream reporting entities, the best guidance we can give you is to tread lightly when drawing any broad conclusions or making specific determinations about a facility. Similarly, while we are confident in our presentation of the data and the calculations made within, we cannot guarantee that we didn't miss something. It took us a full week to determine whether or not steam was being reported in Mlb or Klb so it's entirely possible we missed something else. Put another way, our lawyers insisted that we tell you to "Use the Energy Map at your own risk". In the same breath, if you have any specific questions about how we made certain calculation or assumptions, just ask and we'll be happy to give all due clarification. The design is based on a reusable codebase that is largely agnostic to the source energy data and the geographic location. By abstracting the data layer, the visualization - and extensions to it - can easily accommodate new data structures from sources that don't happen to have the same structure as the City of Boston data. More specifically, given that we will be using the Energy Map in our work with Green Communities and other towns, cities, campuses and property portfolios, we took care to develop the data model in a way to maintain compatability with popular data sources such as MEI, EPO and others. Our design intent was to deliver an exploration tool that doesn't prescribe a limited set of questions that it will answer. Rather, our goal was to deliver an interactive tool that can answer a wide range of energy questions for any number of constituencies who wish to engage. Given our work with energy managers in the MUSH and C&I facilities throughout New England, it should make sense that our main motivation was to deliver a holistic and interactive entry point as a natural segue into the more detailed work that we do at individual facilities. With this approach a wide range of interests are served at a very high exploratory level, but we set the stage to dig deeper into more specialized reviews within individual facilities. Finally and for good measure, we designed the visualization to be compatible with the popular data sets in the space: Green Button, MEI data popular with many of the Green Communities in Massachusetts, and Energy Portal Online interval data provided by the region's utilities. With this, we have developed an exploration tool that is plug-compatible and easily deployed for any city or town, any university or college campus, or any property management portfolio that is looking for a comprehensive view of their energy use. The City of Boston did not pay AEI for this work and offers no warranty or endorsement of the work, expressed or implied. The City provides the open data as-is and cannot be held liable for any errors or omissions therein, or any calculations, assumptions or conclusions based on the data. Source facility data files are the property of the City of Boston Environmental & Energy Services and are provided to the public without warranty, subject to the terms of the Creative Commons CC-BY license. On their website, City of Boston also attributes the data to Department of Energy, Environment, and Open Space (EEOS), DoIT, and City of Boston Auditing. The data files we used are available at https://data.cityofboston.gov/. Real-time data retrieved from ISO New England is governed by their legal policy at http://www.iso-ne.com/legal-privacy. We make 5 minute calls to their web services for purposes of retrieving real-time load data, and we cache the data locally to guarantee that frequency is not exceeded. Real-time and historic weather data is provided by the Weather Underground API web services subject to the terms of their license agreement at https://www.wunderground.com/weather/api/d/terms.html. Their privacy polic is located at https://www.wunderground.com/about/privacy.asp. The AEI Energy Map visualization, all of its properties, methods, and visual design are copyright ©2016 Advanced Energy Intelligence and may not be reproduced, excerpted or hosted without our expressed written consent. The visualiztion, its calculations and presentation are provided as-is and without any warranty expressed or implied. Use at your own risk. If you wish to carry a link to this visualization, please contact us for a permalink. Contact AEI at info@aeintelligence.com for more information. Mouse hover on any circle for quick facility info; click a circle for full facility details and utility data.